While playing Astroneer, I kept messaging my colleagues about cool ways it had killed me. It was a morbid thing to be excited about. But a satisfying death is the hallmark of a good survival game, and, even in its early stages, Astroneer has a lot of them. Astroneer is a space survival game that’s currently in early access on Steam and Xbox. It has a solo mode, as well as co-op. I’m on PC and haven’t tried co-op, but I have wandered around alone dying a lot. In the early game, I mostly suffocated. 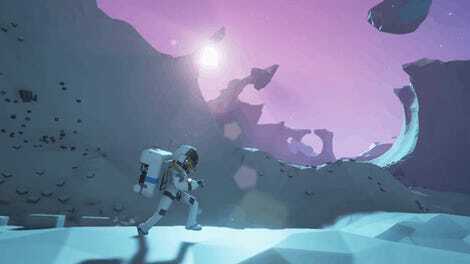 You don’t need to eat or drink in Astroneer, but you do need to breathe. Your character lands on a procedurally generated planet with only a small pod and a mining tool. The pod provides oxygen via a thin blue tether that fills the small reserve tank on your astronaut’s back. The mining tool lets you form the planet’s surface; you can dig holes, build hills, smooth edges, and vacuum up crafting resources. You’ll quickly need to venture away from your life-giving pod in pursuit of these resources, which raises the question of how you’ll keep your lungs full long enough to get there and back. You can extend the reach of your pod’s oxygen by collecting a resource called compound to build tethers. I soon had blue, oxygen-rich lines extending across the planet’s surface. But in my early game, new vistas and unfamiliar resources were just out of reach of my limited tethers. Astroneer’s interface is simple and diegetic; your oxygen meter is displayed on your back, along with the power left in your mining tool and any resources you’ve gathered. It’s easy to tell exactly how much oxygen you have and how many resources you need to gather to craft that cool new thing. What this meant to me: I will definitely not suffocate if I run over there super fast. I definitely suffocated. I tend to favor exploration over base-building in survival games, and I could never resist going a little bit farther than I should have. The blocky environment can look similar at times, and I often got myself turned around in my panic to run back to my oxygen before I suffocated. As my tethers extended, I’d forget where their ends were, especially before I could build beacons at their limits. I ran out into the world and suffocated. It was always my fault for pushing myself just a little too far, and it always showed me an interesting new area I knew I had to reach, which usually led to suffocating again. You can add oxygen reserve tanks once you have the right materials; it’s not hard to upgrade, and suffocation became a minor concern once I had my feet under me. You can also add solar panels and generators that power your mining tool, and even build buggies and other vehicles so you can travel further afield. But the need for oxygen means you always have to be attached to a structure in some way. It’s a fascinating resource to manage, and building tethers connected me to my base in a way that made it feel vital rather than just a place to keep my extra stuff. I got a bit sentimental looking at my tethers, admiring the comforting zig-zags that made a small but meaningful mark on my planet. Tethers also serve as landmarks, which can help you find your way when the environment gets hostile. Some of my planet’s most notable features were the crashed shuttles scattered about. The game is mostly wordless; it’s not clear who these are the remains of or why, but they stand out on the horizon and beg for a poke around. The crash sites often contain rare resources not found in the environment, as well as spaceship pieces. These pieces can be researched via an upgrade you can build in your base, so they’re worth checking out to unlock new crafting recipes. A close-up look at your backpack. You can see exactly what you have and craft right from it. It can be clunky at times, but it’s pretty cool. In one of my games, my tether almost reached a crash site. There was even a natural oxygen reserve right between the end of my tether and the site that I could stock up at until I mined it bare. I filled up and made a run for it. It was, as suspected, a bounty of riches— but then a storm kicked up. Storms happen randomly, but they telegraph themselves with an ominous, low roar and a dark swirl on the horizon. They obscure visibility and send rocks and debris flying. When a storm came rushing over the crash site I was exploring, I quickly dug a hole with my mining tool to wait it out. Rocks smashed terrifyingly close to me, but I was pretty proud of my quick thinking and ingenuity. I even had a poke around and kept gathering resources while I waited. Aluminum! Copper! Some lumpy rock I could research! And then I realized I was almost out of oxygen. I ran out into the storm, fumbling for the oxygen reserve while holding the researchable rock aloft. The storm turned the entire environment into a dark blur. Giving up on that, I pushed against the wind for the end of my tether. The storm pushed me back, and the rock wasn’t helping matters. My oxygen meter ticked down. Debris smashed into me, knocking off health and sending me stumbling. I wouldn’t drop the rock. I could do this. The storm cleared just in time for me to suffocate, feet from the end of my tether. As ever, it was completely my own fault, and it was great. That dark blur is a storm coming in. It’s going to be a problem. When you die in Astroneer you respawn at your base with an empty backpack, but your body (and your loot) sticks around. You can go back and get it, but you shouldn’t always. At one point I came across a cave full of resources I’d never seen before. I jumped in, only to be killed by some mysterious gas-spewing plants. Further efforts to retrieve my body led to more deaths. I couldn’t resist poking around the cave and got lost. I came across new, deadlier enemies. I fell from too high up. The cave quickly became a death cave, piled high with my corpses and their backpacks. I couldn’t resist one more try. It became a personal quest. I even tried to mine holes above the cave and then use my mining tool’s alternate mode to raise my body to the surface, but more often than not I’d get too close to the edge, fall in, and die. That X is the first of many bodies. Curse you, death cave. Caves are dangerous, but they have the best loot, and you’ll need it to make progress in the game. Minerals you find in them can be smelted into core components and used to extend your base. In the three hours I’ve spent with the game I’ve already built a vehicle bay, a smelter, a research station, and a printer. Each module you can add to your base provides new crafting possibilities that require more resources, pushing you out across the planet while helping you get there. (You can even build a space shuttle and fly to a new planet, but I haven’t quite exhausted the deaths available to me on my starting one.) 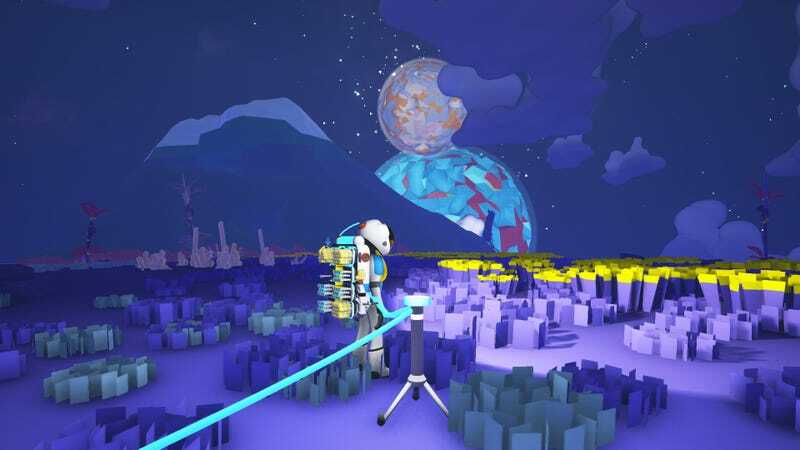 The craftable options available so far aren’t revolutionary in terms of what you can usually craft in survival games, but Astroneer’s simple look and the immediate, tangible benefits of crafting them make them satisfying and exciting. According to the developers, Astroneer will be in Early Access for a year or two. I had some technical problems, including a lot of framerate drops and crashes, but patches have already been deployed, and I’m sure there’ll be more in the works. Astroneer is already off to a promising start, with plenty of places to explore and interesting ways to die. There’s not much more I want from a survival game than that.